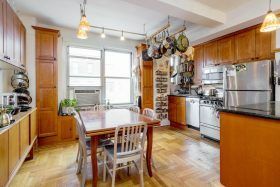 Chef-to-the stars Adeena Sussman just listed her Upper West Side co-op at 410 Central Park West for $800,000. She’s worked with a number of celebrity clients, including co-authoring cookbooks with model Chrissy Teigen, Candace Nelson of Sprinkles Cupcakes, Lee Schrager of the South Beach Wine and Food Festival, and actor David Burtka. Unsurprisingly, the open kitchen of this one-bedroom pad is well designed and fully equipped. And the rest of the apartment is finished with prewar details like hardwood floors, nine-foot beamed ceilings, and crown moldings.